IN THE Noonday Lily block the three small pieced squares are made first, then joined together as shown with two plain blocks of the same size. Then a larger square, the area of four small squares or about 9-inch cuts for the remainder of the block. Onto this applique stems and leaves, and a corner clips off to be replaced with green. The longer straight stem pattern also is not given, but should be about 12 inches long of the darker green. Twenty-five whole blocks set together diagonally with plain pale green squares of equal size makes a center about 83 inches square. The border of light or darker green could be enhanced by small pieced lily squares appliqued at regular intervals. 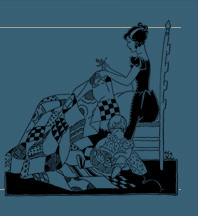 Borders may be wider at top and bottom to make the quilt longer than wide. This is an unusual color scheme for the Noonday Lily. Usually the background is white, blossom two shades of some hue such as rose pink, orchid or yellow, with green. Our ready cut quilt No. 300M, at $4.00, is in rose pinks and green with white background. 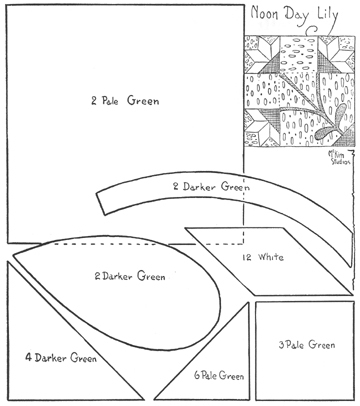 Material Estimate: For the plan described you should allow 6 1/2 yards of pale green, 1 1/2 yards of darker green, and 1 yard of white.